If you’re visiting Montana’s second-largest city, you can start the day by picking up fresh produce and baked goods at one of the farmers markets and end it with a perfect dinner at The Silk Road. In between, this handsome city lying at the convergence of five mountain ranges offers plenty of ways to occupy your time, from kayaking to college football games to a ride on the hand-carved A Carousel for Missoula while listening to music emanating from the largest carousel band organ in the United States. A stroll around the city is just as rewarding, giving you ample opportunity to check out some historic and quite beautiful buildings. These are my favorites. When I first saw University Hall on the campus of the University of Montana, smoky skies from nearby forest fires muted both the building and the entire campus, not to mention the wonderful mountain backdrop behind it. But about four hours later, the wind had shifted just as dusk was arriving, bringing Missoula’s iconic building to life, with the fading sun warming up the red bricks and reflecting brilliantly in the windows. The cornerstone of the building was laid in 1898; one year later, it was formally opened in a ceremony that included pouring corn, oil, and water (representing plenty, joy, and peace) over the cornerstone. Today, this is the gorgeous building that draws you onto the 156-acre campus. With Mount Sentinel in the background (with a large, concrete letter M planted 620 feet up the hillside), University Hall beckons you. Designed by architect A.J. Gibson, the Richardsonian Romanesque building rises two stories above a stone base and has a steeply pitched roof with arched mansard windows. The real eye-catcher is the central tower, with clocks on all four sides and a subtle letter M behind the hour and minute hands. Bells in the tower chime hourly. Verdigris green tiles cover the tower’s pyramidal roof, which is anchored at the corners by four turrets. Fronting the Oval at the heart of the campus, and equally striking in winter, with the snow-covered mountain behind it, University Hall makes you wish that this was your alma mater. Architect A.J. 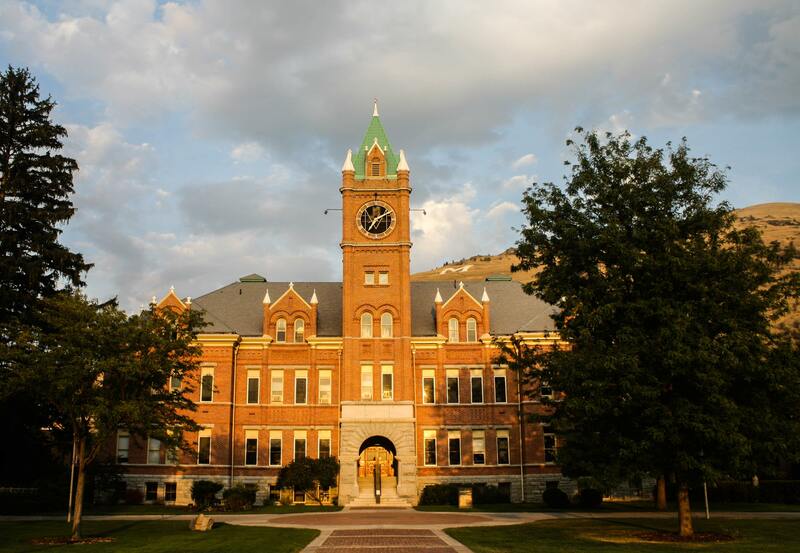 Gibson struck gold again, with the Missoula County Courthouse. Occupying an entire city block in downtown Missoula, the courthouse is a stately building approached by a well-trimmed lawn, flowerbeds, and a handsome gazebo, which was funded by private donations and grants. 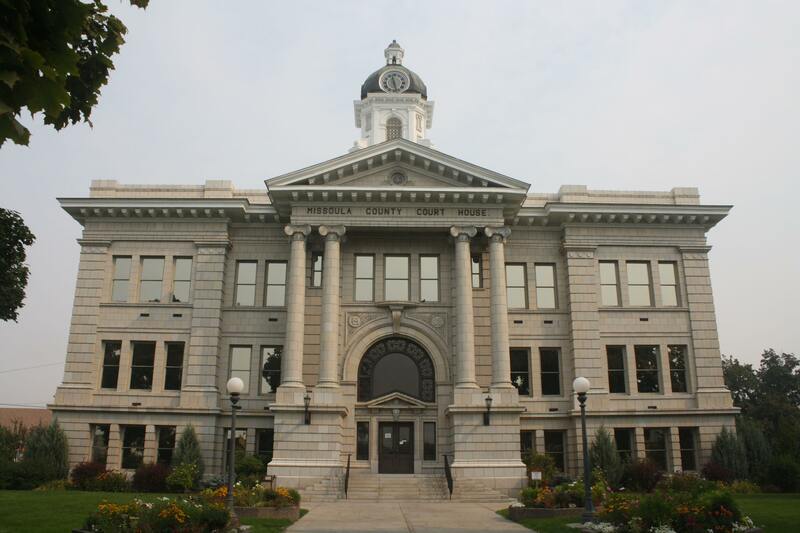 Completed in 1910 and added to the National Register of Historic Places in 1976, the neoclassical two-story courthouse features columns and porticos over the entrances on three sides (the rear is attached to a less-than-remarkable annex added in 1966). The native sandstone building is topped with a wonderful iron-clad dome, crowned with a clock tower with clocks on all four sides, housing a two-ton bell that rings every 30 minutes. Inside, you’ll find an impressive rotunda with an ornately decorated dome, plaster columns that change order by floor, and eight murals of Sacagawea, Lewis and Clark, and half a dozen scenes depicting major events in early Montana, all created over the course of 16 months and completed in 1916 by Edgar Samuel Paxon, best known for his painting Custer’s Last Stand. Since it opened in 1892, St. Francis Xavier has stood as the tallest church in Missoula and one of the tallest in Montana. This Jesuit church was constructed in the Romanesque Revival style, with semicircular arches over the doors and windows, smaller arches along the eave line, small buttresses, and a tower that holds a 2,270-lb. bell. Overall, it’s a fairly subtle building, but once I stepped inside, my impressions changed. The cruciform plan was designed to hold 150 worshippers in the choir loft and 600 more sitting in the nave under a barrel vault and the two side aisles, defined by parallel arcades with a cornice that runs in an unbroken line around the semicircular apse, unifying the sanctuary area with the rest of the church. The original organ, added in 1904, contains about 1,800 pipes, the visible ones repainted in turquoise when it was restored in 1965, complementing the turquoise on the columns below. The artwork is even more striking. Stained-glass windows, donated by pioneers, cast the interior in a golden glow on sunny days. 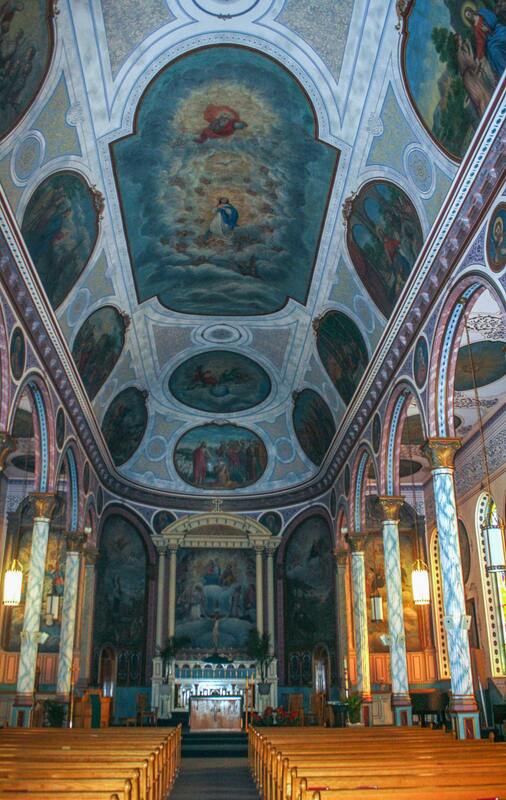 These windows were added in the very early 1900s, replacing the original ordinary glass windows in attempt to guard the church’s most notable feature from damaging sunlight — the 14 Stations of the Cross and 66 frescoes, all painted by one man, Brother Joseph Carignano of the Society of Jesus. Over the course of 18 months during 1901 and 1902, Carignano, a native of Turin, Italy, expended great effort in painting the murals as graphic depictions of Christian belief on the church’s ceiling and pale rose walls, creating a harmonious and visual catechism and featuring scripture stories, the symbols of the liturgy, and saints following Jesus’ example. He chose vibrant colors to counter the grayness of Montana winters, and his fine work, inspired by early Renaissance Italy, balanced the rugged lives of the early pioneers here. When Carignano died in 1919, his obituary included a Biblical quote from Hebrews 11:4: “he being dead yet speaketh,” appropriate for the ongoing life of his art, made even more astounding by the fact that he was an untrained artist who worked as a cook in a nearby mission. 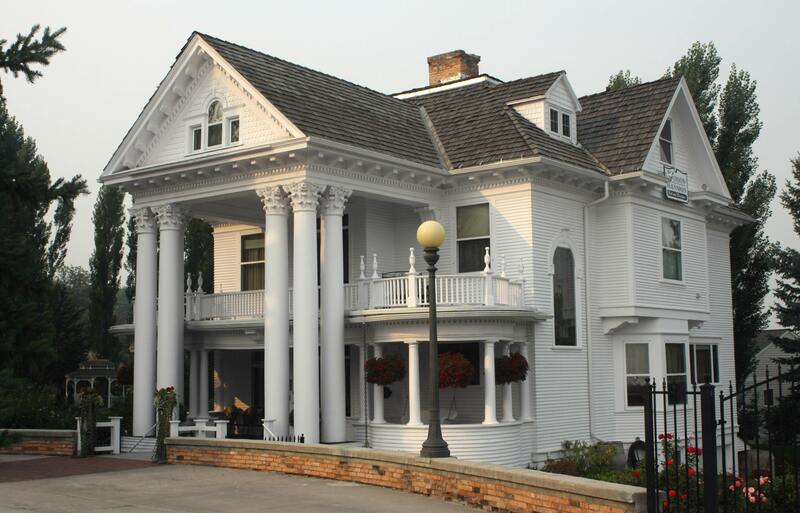 Before heading to Glacier National Park, my city break in Missoula was hosted by Tom and Nancy at the Gibson Mansion Bed & Breakfast, less than two miles from downtown’s attractions, including multiple historic districts and the outstanding Silk Road restaurant. Originally built as a private home for an immigrant Swedish pharmacist in 1903, over the course of its history the mansion became a sorority house, an apartment building, and a fraternity house. After too many keggers, it was a wreck and was slated for demolition in 1979. Saved by a private owner who moved it to its current location (a feat in and of itself, as the wide load slowly moved along the streets of Missoula), the mansion was purchased in 2001 by the current innkeepers, who lovingly and meticulously converted it into the grand B&B it is today, including the curved porch, gleaming white Corinthian columns, gable roof, and finely manicured garden. Inside, the parlor fireplace, library, grand oak staircase, leaded stained-glass windows, and luxurious rooms mix historic details with contemporary creature comforts. I appreciated all of it over a breakfast of an orange omelet soufflé with chicken sausage one morning, seared peach and huckleberry pancakes with peppered bacon the next, ensuring its reputation as the nicest, warmest, and most elegant place to stay in Montana’s second-largest city. 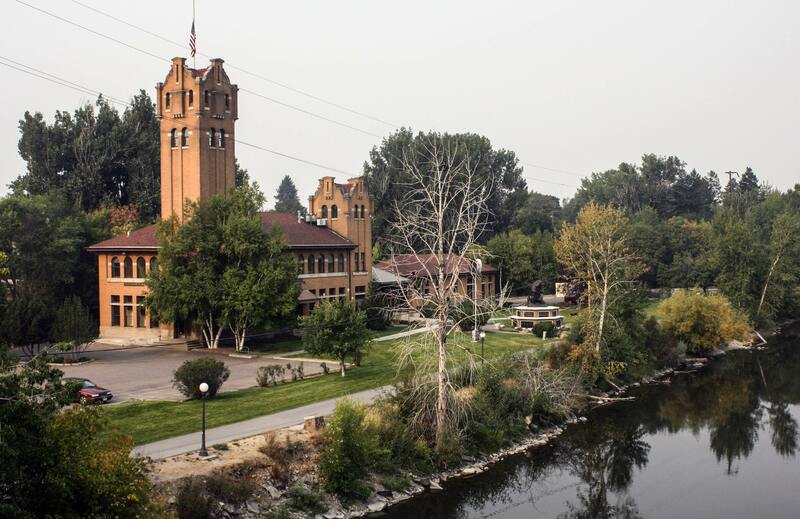 On the banks of the Clark Fork River that cuts through the city, I checked out the old Milwaukee Depot. In 1992, the Boone and Crockett Club — the oldest wildlife conservation group in the United States — purchased the then-vacant railroad depot as its new headquarters. But the building goes much further back, to when it was home to restaurants and supper clubs in the 1980s, freight department offices in the 1970s, and a passenger terminal in 1910, when it was built by the Chicago, Milwaukee, St. Paul and Pacific Railroad. Completion of the transcontinental line through Missoula solidified the town’s role as a major urban and trading center. The two-story depot complex consists of two brick buildings — a baggage room and the grander passenger waiting rooms and station agent’s office. Two towers of different heights rise above it; the taller five-story tower dominated the city’s skyline in the early 20th century — and, just like today, made the depot easy to find. Architect J.A. Lindstrand employed a Spanish Mission–style design, with Romanesque windows, castle-like parapets, and red Spanish tiles for the roof. Inside, the 15-foot coffered ceilings with milled wood beams still remain, as do the molded wood and the relief-paneled wainscoting. Added to the National Register of Historic Places in 1982, this train station makes for an interesting stop when you’re pedaling along the riparian bike lane beside it. Also look for the depot’s appearance in one of the city’s outdoor murals, the 19-foot-wide Missoula Railroad History.